UPDATED, WITH NEW MATERIAL. Within every woman there lives a powerful force, filled with good instincts, passionate creativity, and ageless knowing. She is the Wild Woman, who represents the instinctual nature of women. But she is an endangered species. 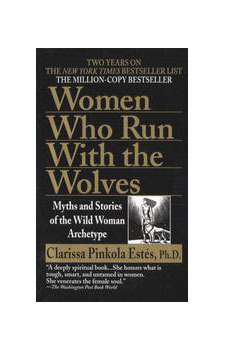 In Women Who Run with the Wolves, Dr. EstTs unfolds rich intercultural myths, fairy tales, and stories, many from her own family, in order to help women reconnect with the fierce, healthy, visionary attributes of this instinctual nature. Through the stories and commentaries in this remarkable book, we retrieve, examine, love, and understand the Wild Woman and hold her against our deep psyches as one who is both magic and medicine. Dr. EstTs has created a new lexicon for describing the female psyche. Fertile and life-giving, it is a psychology of women in the truest sense, a knowing of the soul.